SANTA MONICA, California -- Famed '60s anti-war activist Tom Hayden, whose name became forever linked with the celebrated Chicago 7 trial, Vietnam War protests and his ex-wife actress Jane Fonda, has died. He was 76. He died on Sunday after a long illness, said his wife, Barbara Williams. 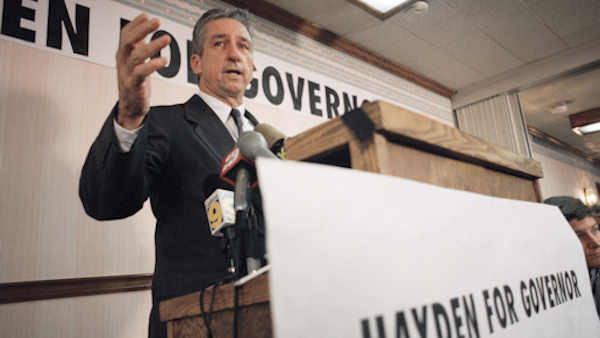 Hayden, once denounced as a traitor by his detractors, overcame his past and won election to the California Assembly and Senate where he served for almost two decades as a progressive force on such issues as the environment and education. He was the only one of the radical Chicago 7 defendants to win such distinction in the mainstream political world. He remained an enduring voice against war and spent his later years as a prolific writer and lecturer advocating for reform of America's political institutions. Los Angeles Mayor Eric Garcetti praised Hayden. "A political giant and dear friend has passed. Tom Hayden fought harder for what he believed than just about anyone I have known. RIP, Tom," Garcetti said Sunday night on his Twitter account. Hayden wrote or edited 19 books, including "Reunion," a memoir of his path to protest and a rumination on the political upheavals of the '60s. "Rarely, if ever, in American history has a generation begun with higher ideals and experienced greater trauma than those who lived fully the short time from 1960 to 1968," he wrote. "We are people of this generation, bred in at least modest comfort, housed now in universities, looking uncomfortably at the world we inherit," began the statement which outlined a plan for a revolutionary campus social movement. After a circus-like trial, Hayden and three others were convicted of crossing state lines to incite riot. The convictions were later overturned, and an official report deemed the violence "a police riot." The trial became the subject of books, a play and Hayden's own reflections in "Voices of the Chicago 8: a Generation on Trial." Thomas Emmet Hayden was born Dec. 11, 1939, in Royal Oak, Michigan, to middle-class parents. At Michigan, he took up political causes including the civil rights movement. He wrote fiery editorials for the campus newspaper and contemplated a career in journalism. But upon graduation, he turned down a newspaper job. As he wrote in his memoir, "I didn't want to report on the world; I wanted to change it." He joined the fledgling Student Non-Violent Coordinating Committee (SNCC), went freedom-riding during civil rights protests in the South and was beaten and briefly jailed in Mississippi and Georgia. He married a fellow activist, Sandra "Casey" Cason, and together they witnessed the violence of the battle against segregation. In 1965, Hayden made his first visit to North Vietnam with an unauthorized delegation. He found out later that his movements were being tracked and recorded by the FBI, as they would be from then on. In 1967, he returned to Hanoi with another group and was asked by North Vietnamese leaders to bring three prisoners of war back to the United States. With the prisoners suffering medical problems, the U.S. State Department thanked Hayden for his humanitarian action. In the interim, a single event galvanized him - the 1968 assassination of his friend, Sen. Robert F. Kennedy, in Los Angeles. "I went from Robert Kennedy's coffin into a very bleak and bitter political view," Hayden told the Associated Press in 1988. "I think it confirmed for me that there was no future and brought out a lurking belief that this was a really violent country and that I was headed into apocalyptic times." Police assaults on student demonstrators in Chicago seemed to confirm his belief. But he later said he was wrong. In 1971, Hayden met Jane Fonda, a latecomer to the protest movement. After he heard her give an eloquent anti-war speech in 1972, Hayden said they connected and became a couple. He was divorced from Cason and had been through other romances. Fonda was divorced from director Roger Vadim and had a daughter, Vanessa Vadim. Both Hayden and Fonda were demonized by the political right after she visited North Vietnam in 1972 and was photographed on a North Vietnamese anti-aircraft gun. It took many decades to minimize her "Hanoi Jane" moniker. In 1992, Hayden won election to the state Senate advocating for environmental and educational issues. However, his radical past disturbed conservatives and interfered with his legislative initiatives. By then, he and Fonda were divorced, their relationship having withered as she returned to acting and built an exercise empire. Fonda later married and divorced billionaire Ted Turner. Hayden married actress Barbara Williams, and they had a son, Liam. After leaving public office, Hayden wrote and traveled extensively, lecturing, teaching and speaking out against the wars in Iraq and Afghanistan. He was also an advocate for animals, and in 2012 he lobbied Gov. Jerry Brown to preserve a piece of legislation known as Hayden's Law, which he had authored to protect shelter animals from premature euthanasia. Hayden acknowledged at the end of his memoir that his time as a counterculture rebel had been the most exciting and fulfilling of his life.